Jennifer Echols made me a fan of hers when I read Going too Far and while I haven’t enjoyed every single book by hers that I’ve read, I still gobble her books up whenever they come out. 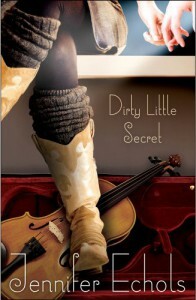 Dirty Little Secret was another winner for me and I’m still smiling over how much I liked this book.Bailey’s having a bad year. For as long as she can remember, she’d been playing her fiddle with her sister all over the place and when a record label wants to sign her sister, without her, Bailey is kicked to the curb while her sister goes off and gets famous. Suddenly, left without a band to play in, Bailey hides her disappointment and hurt with her parents by acting out. Now she’s moved in with her grandfather while her parents are out on the road with her sister and she can’t do a damn thing on her own. She can’t make trouble, she can’t tell anyone her last name because the record label people don’t want a scandal that will taint the progress that they’re making with Julie’s career.I really liked this book. I loved the Nashville setting, the country music scene and the romance that blossomed between Sam and Bailey and I really liked when Bailey finally spoke up for herself. It’s really disappointing for me as a parent to see parents portrayed so selfishly and displaying favoritism toward their kids. I’m not perfect but my daughter’s happiness is important to me and I try to make her as happy as I can be and it’s sad to me that not too many parents are portrayed as good parents in the books that I’ve been reading lately. Bailey’s parents fall into this selfish category and they pissed me off in this book.So Bailey joins Sam’s band and the band really takes off. There’s a lot of drama between the bands because Sam used to date the drummer and she hasn’t gotten over him but he’s trying to keep the peace even though he really likes Bailey. So that was interesting and I really liked that they played songs that I actually know and like. It’s not very often that I know the songs that are mentioned in the books that I’m reading but I love me some Zac Brown Band and I loved Sam and Bailey’s band because they covered their songs.What I really liked about this book is that the story came alive through the words on each page. 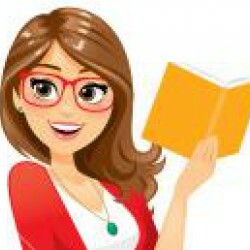 I was so wrapped up in the story that I felt like I was a part of the book and not just reading it. I think Echols excels at this and when I closed the book, I had a goofy smile on my face because the book ended just the way that I wanted it to and I felt the resolutions in the book were dealt with in a realistic way and I really liked that.There were times when I wanted to strangle both Sam and Bailey because they fought so much and usually they found about things that in the grand scheme of things were just not important. But you can see the growth between not just them but each character in the book and I really liked that.I definitely recommend this book.Grade: 4 out of 5This review was originally posted on Book Binge. This book was provided by the publisher in exchange for an honest review.